A simulated Higgs boson decay in the ATLAS detector. An actual decay of a suspected Higgs boson into two gamma rays (thick green lines) in the CMS detector recorded in 2012. Image credit: CERN. The Higgs boson is the final, long-anticipated member of the so-called Standard Model of particle physics – the pre-eminent theory describing how particles and forces interact. The Higgs boson is hypothesized as giving all other particles mass through what is called the Higgs field. The search for the Higgs boson, which became like a Holy Grail quest among particle physicists, is nearing a conclusion. In July 2012, scientists announced results obtained using both the ATLAS and CMS experiments at the Large Hadron Collider which confirmed the existence of a new particle with a mass of about 125 GeV (roughly equal to the mass of two copper atoms). 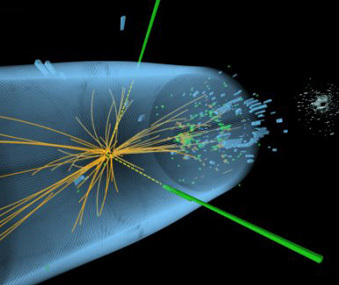 This particle was subsequently recognised to be Higgs boson. The discovery of the Higgs does not mark the end of the road for our understanding of nature at the finest level. The Standard Model fails to explain several very significant aspects of the universe we live in, including dark matter, dark energy, and neutrino oscillations. Nor does it embrace one of the key forces in nature – gravity. So, even following the discovery of the Higgs, the search continues for other particles that will point the way to other, deeper theories, such as supersymmetry. Elementary particle masses (in particular the difference between the massless photon and the very heavy W and Z bosons), and the differences between electromagnetism (caused by the photon) and the weak force (caused by the W and Z bosons), are critical to many aspects of the structure of microscopic (and hence macroscopic) matter; thus, if it exists, the Higgs boson has an enormous effect on the world around us. Results announced on December 13, 2011, by scientists at the Large Hadron Collider, pointed to the possible existence of the Higgs boson. In particular, two large detectors, called ATLAS and CMS, found indications of a particle at about the same mass (125 GeV). In March 2012, data from the now-defunct US Tevatron collider pointed to a mass for the Higgs between 115 and 152 GeV. On July 4, a major announcement was made by CERN researchers, indicating that a new particle has been found, which is now accepted as being the long-sought-after Higgs boson. The Higgs mechanism was first theorized in 1964 by Peter Higgs, François Englert and Robert Brout, working from the ideas of Philip Anderson, and independently by G. S. Guralnik, C. R. Hagen, and T. W. B. Kibble. Steven Weinberg and Abdus Salam were the first to apply the Higgs mechanism to the electroweak symmetry breaking. The electroweak theory predicts a neutral particle whose mass is not far from the W and Z bosons. 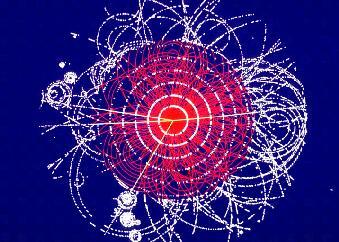 The particle known as the Higgs boson is the quantum of one of the components of a Higgs field. In empty space, the Higgs field acquires a non-zero value, which permeates every place in the universe at all times. The vacuum expectation value (VEV) of the Higgs field is constant and equal to 246 GeV. The existence of this non-zero VEV plays a fundamental role: it gives mass to every elementary particle, including the Higgs boson itself. In particular, the acquisition of a non-zero VEV spontaneously breaks the electroweak gauge symmetry, a phenomenon known as the Higgs mechanism. This is the simplest mechanism capable of giving mass to the gauge bosons (i.e., the other bosons in the Standard Model) that is also compatible with gauge theories. In the Standard Model, the Higgs field consists of two neutral and two charged component fields. Both of the charged components and one of the neutral fields are Goldstone bosons, which are massless and become, respectively, the longitudinal third-polarization components of the massive W and Z bosons. The quantum of the remaining neutral component corresponds to the massive Higgs boson. Since the Higgs field is a scalar field, the Higgs boson has spin zero and has no intrinsic angular momentum. The Higgs boson is also its own antiparticle and is CP even. The Standard Model does not predict the value of the Higgs boson mass. If the mass of the Higgs boson is between 115 and 180 GeV, then the Standard Model can be valid at energy scales all the way up to the Planck scale (1016 TeV). Many theorists expect new physics beyond the Standard Model to emerge at the TeV-scale, based on unsatisfactory properties of the Standard Model. The highest possible mass scale allowed for the Higgs boson (or some other electroweak symmetry breaking mechanism) is around one TeV; beyond this point, the Standard Model becomes inconsistent without such a mechanism because unitarity is violated in certain scattering processes. Many models of supersymmetry predict that the lightest Higgs boson (of several) will have a mass only slightly above the current experimental limits, at around 120 GeV or less. Precision measurements of electroweak observables indicated that the Standard Model Higgs boson mass had an upper bound of 144 GeV at the 95% confidence level as of March 2007 (incorporating an updated measurement of the top quark and W boson masses). Searches for the Higgs boson were made at the Fermilab Tevatron, which was permanently shut down in September 2011. The limits on the production cross section of the Higgs boson set by the on-going Tevatron searches were less than a factor of 3.5 away from Standard Model predictions in the mass range where the Higgs boson primarily decays to an on-shell W boson and an off-shell W boson.2 There had been optimistic articles about potential evidence of the Higgs boson,3 but evidence compelling enough to convince the scientific community as a whole. With the December 13, 2011 announcements from CERN, however, the situation changed. The fact that two major detectors at the LHC, ATLAS and CMS, found strong signs of a particle in the same narrow energy range had physicists eagerly anticipating further measurements and analysis which, when they were made, formed the final proof that the Higgs does indeed exist. The Higgs boson that has been found may not necessarily be the only kind of Higgs boson in nature. Although the Standard Model needs only one type of Higgs boson to be complete, there are other theories beyond the Standard Model, such as supersymmetry, which predict the exist of a family of Higgs particle. 1. Searches for Higgs Bosons (pdf), from W.-M. Yao et al. (2006). 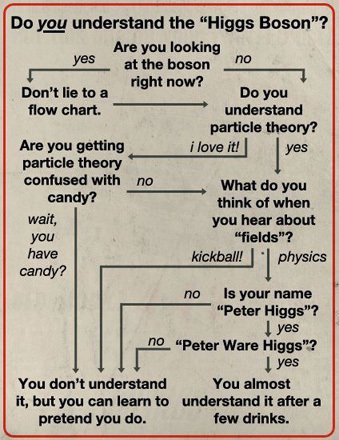 "Review of Particle Physics". J Phys. G 33: 1. 2. Combined DØ and CDF Upper Limits on Standard-Model Higgs-Boson Production.